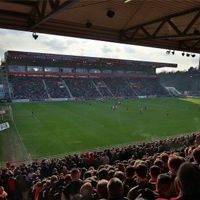 Supporters were first allowed inside the main stand in February, seeing capacity rise to 22,000 people at Berlin’s Alte Försterei. But despite the actual opening, works are still ongoing on site – facades, furnishings or sett installed between stand and the pitch. To celebrate the official delivery of the new structure and in fact the end of redevelopment began back in 2008, Union invited Celtic to play a friendly game on July 12. The 44-time champions of Scotland are expected to play in their strongest lineup. The revamp of Alte Försterei became famous worldwide thanks to Union fans. They worked voluntarily on the construction site, aiding the club to stay within a very tight budget.